In this chapter, a study about how Italian SMEs understand and use FinTech technologies is presented. The study focuses on FinTech-aided banking services, in particular, due to the fact that these are, at present, the most widely used FinTech technologies available in Italy. The study shows how, despite FinTech entering Italy only in recently, the Italian SMEs market is very active and fruitful for digital companies. In the last years, a continuous growth of investment has seen the development of FinTech technologies in multiple areas, such as mobile networks, big data, trust management, mobile embedded systems, cloud computing, image processing, and data analytic techniques. In the last years, the term Financial Technology (FinTech) has been adopted in order to describe a wide range of services, aided by several financial technologies (Gabor & Brooks, 2017), for different types of organizations, which mainly address the advancement of quality of financial products and services supported by Information Technology (IT) applications. FinTech has become important due to several important factors, ranging from technical advancement, enterprises innovation, the need for reducing costs, and for improving the relationship with the customers. The high speed in which FinTech has been adopted caused a great challenge, due to the multidisciplinarity, advanced usage of integrated platforms, and increased demand for such services (Gai, Qiu, & Sun, 2018). FinTech is supported with the development of cutting-edge technologies, among which the most relevant are those that can discover hidden information from various sources and thus improve the decision-making process in SMEs, which influence security, and enable easier communication with customers. In Italy, from the end of the first decade of 2000, almost all banks decided to follow new paths, starting a process of exploiting digital opportunities and moving clients onto more agile and less costly channels (i.e., Internet Banking and Mobile Banking) envisioning novel ways for serving clients and generating profit (Premoli, 2017). The chapter has three goals. The first goal of the chapter is to analyze the wealth of digital possibilities, embedded as FinTech solutions and strategic partnerships, that are available for banks to improve their current portfolio of products and services. The second goal is to provide the overview of the FinTech solutions for SMEs, with the focus to Italian banks and FinTech, and to provide the overview of two main venues for increasing their competitiveness: (i) online advisory and internationalization for SMEs, and (ii) product standardization and multichannel distribution. The third goal of the paper is to analyze the main emerging and disruptive technologies in banking domain, adopted by the FinTech industry today (e.g., big data, data mining, text mining, blockchain, AI), which provide a rich source for future research directions for FinTech. The abovementioned goals are attained by (i) conducting a comprehensive literature overview, focusing on cutting-edge research in the area of disruptive technologies (e.g., big data, data mining, natural language processing); (ii) investigating the grey-literature research in order to collect knowledge on Italian FinTech, such as case studies, white papers and industry position papers. The chapter consists of the following parts. After the introduction, the background of the research is provided, focusing on Italian SMEs and their significance for the economy. 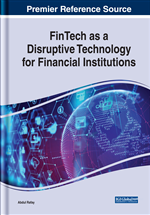 The third chapter discusses FinTech as a new venue for advancing financial products and services, presenting the main technologies used for FinTech applications, the relationship between FinTech and innovation, and the role of FinTech as a disruptive technology in the Italian context. The fourth chapter aims at providing solutions and recommendations for FinTech and Italian SMEs, while fifth chapter provides the overview of future research directions for FinTech, such as big data, data mining, text mining, and others. Finally, a conclusion is provided.